Experimental philosopher Jonathon Keats’ millennium camera experiment. In his book Camera Lucida, the French philosopher Roland Barthes calls cameras “clocks for seeing,” marveling at their inspiring and troubling ability to capture and arrest time, pulling people and events out context. But what if we designed cameras to document the flow and inexorable passage of time, instead of trying to freeze it during moments we want to hang onto? Keats is no stranger to conceptually challenging projects. He recently opened the world’s first photosynthetic restaurant, which serves gourmet sunlight to plants. 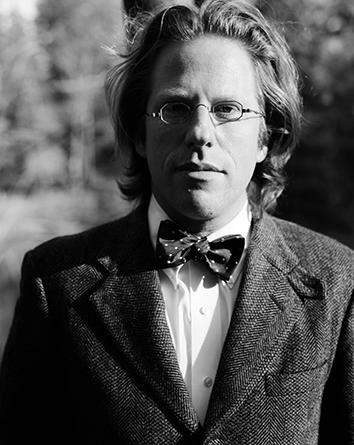 He has exhibited extraterrestrial abstract artwork; choreographed ballet for honeybees; founded Microbial Associates, a corporate consultancy that encourages tech companies to diversify their workforces by hiring bacteria; and attempted to genetically engineer God in collaboration with scientists at the University of California–Berkeley. We can all agree that these cameras are a cool idea. But what are they really for? Why go to all the trouble of designing them, recruiting an army of century photographers, and hiding them all over the place? I interviewed Keats over email to find out. 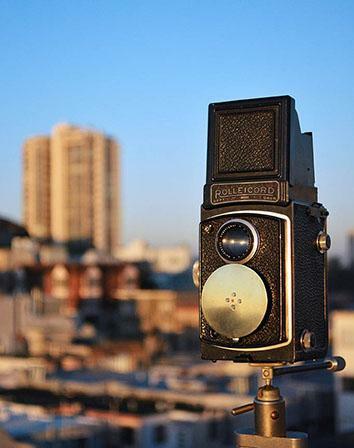 What inspired you to create the century camera and the millennium camera? I live in San Francisco, a city that’s undergoing radical transformation. Whenever I return after months away, I’m struck by how dramatically the city has changed. But within days, I’ve psychologically assimilated the changes, and I stop noticing the transformation. I suspect that this may be one of the main causes of complacency, my own and other people’s. And I think it may be one of the big reasons why the future of cities and the future of our planet often get decided by a few determined financiers and politicians. These cameras are my attempt to compress time, expanding our awareness of change. Is this the first time you’ve experimented with century cameras? 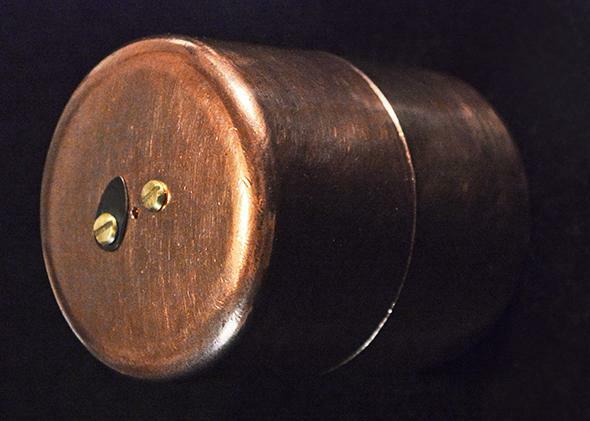 A prototype century camera that Jonathon Keats created by restoring a lovely retro camera. Actually, the first instantiation of this project was in Berlin, a city that’s undergoing astonishingly rapid gentrification. Last year I worked with a local arts organization called Team Titanic to manufacture 100 pinhole cameras, each with a centurylong exposure time. Anyone in the city could take a camera in exchange for a 10 euro deposit, refundable in a century. Berliners hid the cameras in their neighborhoods. Eventually they’ll reveal the cameras’ whereabouts to children, who will be the ones to retrieve the cameras in 2114. How do the century cameras work? What does a pinhole-camera photo taken over a century actually look like? The easiest way to grasp my photographic process—and to envision the end product—is to think about what happens when you leave a book out on your coffee table for a long time. All the colors fade away. The same thing will happen with an ordinary sheet of black paper: The black ink will fade in sunlight, and eventually the page will turn white. But if you were to project an image onto the black paper, then only the bright areas would fade, and you’d eventually end up with a printed picture. 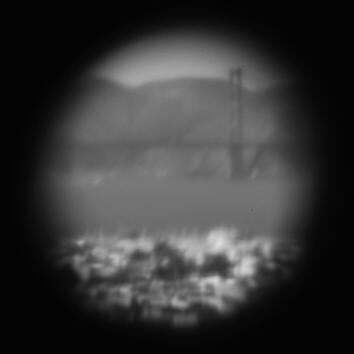 A pinhole camera image of the Golden Gate Bridge gives you an idea what a century photo might look like, though we don’t have any yet. So that’s how my cameras work. A miniscule pinhole focuses the light and projects it onto a sheet of black paper at the back of the sealed capsule. The light bleaches an image into the ink very gradually because the light let in through the pinhole is minimal. Over a century or so, if all goes well, a picture should become visible. Anything that stays in place will look sharp. Anything moving quickly, like cars and people, won’t show up at all. And anything that changes slowly, like a growing tree, will be ghostly. You’ll also be able to see bigger changes, like the ghost of a house that’s been knocked down haunting the apartment building that takes its place. The picture will be less like a snapshot and more like a single-frame movie. Will the photos created by the century camera be beautiful? Or maybe just confusing? While it won’t be confusing, the image will require interpretation to deconstruct what’s been recorded. You’ll need to re-enact in your mind how the photo came to be, working backward from the city as you see it. And any beauty or ugliness you perceive will depend on whether you find the transformation alluring or repugnant. You really think the cameras will survive? The cameras are tins with holes in the front and pieces of paper at the back. I’ve deliberately made them as low-tech as possible because all technology is prone to break. The hard part is figuring out where to put them. The hiding place has to be out of the way, but with a view worth observing over the long term. You have to consider how the city is most likely to change and what might matter to future generations. It’s a big challenge, but I think it can put people into a mindset of long-term thinking about their environment: what’s important to them, what they want to conserve, and what they’d like to see changed. Maybe even more than the ominous quality of being watched over by unborn children, this has the potential to impact how people live. And if the cameras don’t last … ? Of course there’s a chance of that, or that all the pictures will be overexposed. After all, we’re still in beta. This has never been tried before. I’ll gladly take the blame—posthumously—if there are no pictures to show at Emerge 2115. Yet I think it’s important to emphasize—pre-emptively—that a total failure photographically could still be a success conceptually. The test will be whether people envision their impact on the future more clearly. Is there something unethical about hiding a camera, even if it only produces one photo per century? What about people’s right to privacy? 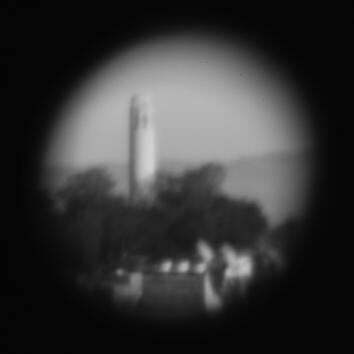 A pinhole camera image of San Francisco’s Coit Tower, albeit not over a century. The morality needs to be decided by each participant. That’s an essential part of the process. Individually and as a society, we need to address whether surveillance is ever permissible. Does it make a difference ethically if the people observing are less powerful than those being observed? Surveillance is generally used to oppress. Can it be subverted to make the world more equitable? If you want my own opinion, hiding a century camera in the city is morally justifiable. Century cameras don’t invade anybody’s privacy because they’re capable only of recording long-term and large-scale change: of watching us collectively. Turning now to the millennium camera, how did you design it so that it will still be in good photographing shape in, say, 995 years? Well, the good news is that many artifacts have survived much longer than 1,000 years, and generally scientists know why. So for my design, I’ve cribbed all I can from archaeology and art conservation. The camera is made of copper, which is resilient and will gradually take on a protective patina. Inside this cylindrical copper casing—set flat against the perforated front end—is a sheet of hardened 24-karat gold. It’s pierced with a pinhole that won’t deteriorate over time because gold doesn’t corrode. Light is focused through the aperture onto a surface of oil paint, which I’ve applied directly to the back interior of the camera using a 16th-century copper painting technique. The pigment is rose madder, an ancient organic color that conservation studies have shown to fade very gradually in sunlight. Over time, the camera will produce a unique image of the changing Tempe, Arizona, skyline in red and white. And what are the chances of getting a good image? As with the century cameras, I can’t guarantee that the picture will be perfect—or even perceptible—when the camera is opened in 3015. Most likely it will take multiple attempts, spanning tens of thousands of years, to get the exposure right. But I don’t see that as a fault. The ongoing iterative process of trying to perfect this technology can provide countless generations with a sense of connection and collective purpose. What about Tempe makes it a good spot to take a 1,000-year exposure photo? Tempe is largely a product of population growth in the greater Phoenix area. It’s representative of both the promise and the perils of urban expansion throughout the United States and around the world. One of the greatest questions of our age is whether cities can make civilization sustainable and how populations can be optimally distributed to use resources efficiently and equitably. The question is especially pressing in Arizona, since growth is constrained by the availability of water, and the availability of water is likely to destabilize with the climate. Tempe provides a telling perspective on urbanization both now and in a thousand years. Is Tempe the only place that you’re planning to install a millennium camera? In April, I’ll install a second camera at Amherst College in Massachusetts. The camera will be placed in the spire overseen by the Mead Art Museum and will provide a thousand-year view of the Holyoke Range. In that case, it isn’t about urbanization. The camera will record how our changing climate impacts natural habitat. How do you think installing these cameras might help change the way we think? In a thousand years, these photographs may provide our great-great-grandchildren’s great-great-grandchildren with evidence of our role in the decimation of the environment and the collapse of civilization. Alternately, the fact that we’re being held accountable can help instill a sense of responsibility sufficient to overcome our present-day complacency. Today the image inside each of the millennium cameras is blank. Through our actions, we can decide how the pictures will develop. How can people outside of Arizona participate in the project? What is the ultimate value of deep time photography, and what will it take to achieve its full potential? Think about what would happen if the century camera were a birthright and every child received one. If they were mass-produced in cardboard, these cameras could be made very inexpensively, perhaps for less than a tenth of a cent apiece. They could be freely distributed by UNESCO, which could also host a rolling global exhibition of the photos. Just imagine. Every day, starting 100 years from now, a new worldwide deep-time panorama would be revealed. Combine that with a millennium camera prominently placed in every city, town, and village, all serving as elements in a global network observing our changing environment. The structures supporting these millennium cameras could be as monumental as obelisks, each serving as public counterpoints to the intensely personal experience of privately hiding a century camera. This interview has been edited and condensed for clarity. This article is part of Future Tense, a collaboration among Arizona State University, New America, and Slate. Future Tense explores the ways emerging technologies affect society, policy, and culture. To read more, visit the Future Tense blog and the Future Tense home page. You can also follow us on Twitter.